1. Take apart a loofah and use the netting to get a fishnet manicure look. 2. Follow this diagram to imitate how professional manicurists apply nail polish. 3. Erase mistakes by dipping a tiny brush into nail polish remover. Use an old paintbrush or an eyeliner brush (perhaps the felt tip of an old liquid liner that dried up?) that you don't care for anymore. 4. Use nail polish thinner (NOT nail polish remover!) to revive thick, goopy bottles of nail polish. You may have read that acetone does the trick, but despite working in the short run, it will ruin the polish eventually. This nail polish thinner is $5 from Amazon. 5. Knot a rubber band and use it to get a perfect French manicure tip. 6. Try a rubberized base coat to make your polish last longer. Professional manicurists swear by this stuff. At $7.99, Orly Bonder is a little pricey, but once you try it, you won't go back. The rubberized effect helps to adhere polish. 7. Use ice water to dry your nails in three minutes. Let them air dry for a couple minutes then dunk away. 8. Fix a broken nail using a teabag and nail glue. 9. Add corn starch to clear nail polish to create a DIY matte topcoat. 10. Use a Sharpie for an easily controllable way to create nail art, and here's a super useful trick to keep it from smearing. Hairspray will do the trick. 11. Spray nails with oil spray to set your manicure and prevent smudges. 12. When applying a top coat, run the brush along the top edge (non-cuticle side) of the nail. This will seal in the raw edge of the polish to prevent chipping. 13. Whiten your nails after removing a dark polish. Soak your nails in a solution of hot water, hydrogen peroxide, and baking soda for about a minute. Or you could also put some whitening toothpaste on a toothbrush and scrub the stains off your nail. 14. The first coat of chunky glitter polishes should be dabbed, not brushed on. This will help to distribute the glitter evenly and get the big chunks where you want them. If all else fails, use a toothpick to move the chunks of glitter around. 15. Apply multiple thin coats instead of one thick coat. A thick coat of nail polish will only dry at the top layer, leaving your manicure vulnerable to smudges. 16. Apply Aquaphor or Vaseline to cuticles to protect your skin from errant nail polish strokes. But be VERY careful! Any ointment that gets on the nail will prevent the polish from sticking. Visit Mad Town Macs for more DIY tips. 17. Easily paint a heart with a toothpick. 18. Use Band-Aids (the sheer kind) to get perfect French tips. Peel off towards the cuticle, not towards the nail. Get more info at De Lune. 20. Fix a smudge by licking it. A product called smudge repair works similarly. 21. Soak nails in a solution of water and white vinegar before applying nail polish. You could also just wipe your nails using a paper towel dampened with vinegar. 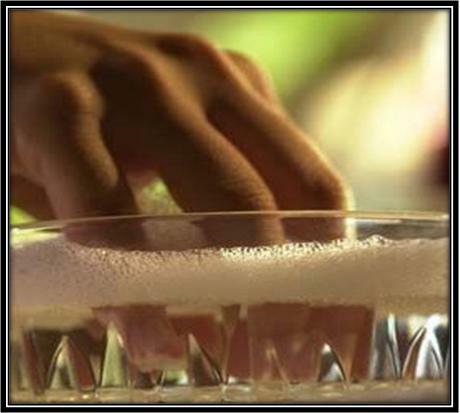 Vinegar will strip the nails of any oils or moisturizers left over from polish remover in order to prevent bubbles. It helps the polish adhere better, therefore prolonging your manicure. 22. Use VapoRub for nail infections. The ingredient thymol works on bacterial and yeast infections of the nail plate. 23. Apply thick hand cream before removing polish if you have pale skin. If you have pale skin, taking off dark nail polish can stain your hands and make you look like you just killed someone. Apply a thick hand cream before removing the nail polish. Soak a cotton pad in remover and place on each nail for ten seconds, one by one. Apply pressure and slide the pad off each nail. Go back and clean up with a new cotton pad soaked in remover to get anything you might have missed. 24. Make a dotter for your nails. 25. If your nail polish is B3F, make sure your base coat and top coat are, too. B3F stands for "Free from Formaldehyde, DBP & Toluene," a standard which many new nail polishes have adopted. If you've ever woken up the morning after a manicure with smudges and dents on your nails, this could be the culprit. If the top coat isnt B3F, it will dry much faster than the polish underneath. 26. If the air is humid, wait extra long for your nails to dry. Humidity can do all sorts of nasty things to a manicure, including the dreaded "bubbling" issue. If it's extra humid outside, make sure you wait twice as long before doing anything that might put dents in your nails. 27. Don't sit near a fan. You might think it'll help the nail polish dry faster, but the drafty air will just make bubbles and ruin your polish. 28. Use a regular old gel pen (like the kind from the office supply store) to draw intricate designs. 29. Put that white nail polish to good use by using it to create an ombré manicure. 30. Apply Elmer’s glue with a thin paint brush, which peels off to reveal a perfect manicure. This is a great technique if you’re doing any kind of messy technique, like water marbling or sponging. 31. You can also use glue to create a peel-off base coat for impossible-to-remove glitter nail polish. Because soaking your nails in acetone to get glitter nail polish off isn't very good for your fingertips. Get the full directions here. This is also a quick way to remove glitter nail polish. 33. Get nails that mimic a shellac manicure.